Maruti Suzuki India Limited is a well-known and popular automaker in India. You can say that the Maruti Limited is a leading four-wheeler automobile manufacturer in South Asia. The Suzuki Motor Corporation of Japan and Government of India jointly had explored as it became the first company in India to mass-produce and sell more than a million cars. Maruti Udyog Limited (MUL) was established in February 1981, though the actual production commenced in 1983 with the Maruti 800. This venture is largely credited to bring an automobile revolution to India. Through 2004, Maruti has produced over 5 Million vehicles. Marutis are sold in India and various several other countries, depending upon export orders. Cars similar to Marutis (but not manufactured by Maruti Udyog) are sold by Suzuki in Pakistan and other South Asian countries. Until recently, 18.28% of the company was owned by the Indian government, and 54.2% by Suzuki of Japan. The Indian government held an initial public offering of 25% of the company in June 2003. As of May 10, 2007, Govt. of India sold its complete share to Indian financial institutions. With this, Govt. of India no longer has stake in Maruti Udyog. It is the market leader in India. On 17 September 2007, Maruti Udyog was renamed to Maruti Suzuki India Limited. The company's headquarters remain in Gurgaon, near Delhi. The company annually exports more than 30,000 cars and has an extremely large domestic market in India selling over 500,000 cars annually. Maruti 800, till 2004, was the India's largest selling compact car ever since it was launched in 1983. More than a million units of this car have been sold worldwide so far. Currently, Maruti Alto tops the sales charts. Due to the large number of Maruti 800s sold in the Indian market, the term "Maruti" is commonly used to refer to this compact car model. Till recently the term "Maruti", in popular Indian culture, was associated to the Maruti 800 model. Maruti Ltd has established its manufacturing units located at two facilities Gurgaon and Manesar south of New Delhi. 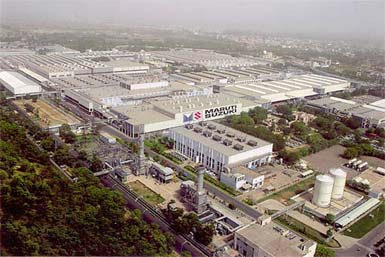 Maruti’s Gurgaon Unit has an installed capacity of 350,000 units per annum. Where the Manesar Unit started in February 2007 comprise a vehicle assembly plant with a capacity of 100,000 units per year and a Diesel Engine plant with an annual capacity of 100,000 engines and transmissions which combined to produce over 700,000 units annually. More than half the cars sold in India are Maruti cars. The Suzuki Motors Corporation of Japan, which owns 54.2 per cent of share of Maruti and the rest is owned by the public and financial institutions of India. It is listed on the Bombay Stock Exchange and National Stock Exchange in India. Maruti 800: Launched 1983. Largest selling car in India, until 2004. Cheapest car in India. Maruti Omni Van: Launched 1984. Till today the Van is running is India roads. Maruti Gypsy : Launched 1985. Maruti Alto: Launched 2000. Currently the largest selling car in India. Maruti Grand Vitara Sports Utility Vehicle Launched in (July 2007). New Mini-SUV in 2010 Likely to be a four-door Jimny. New Luxury Sedan in 2010 Likely to be a production version of the Kizashi.